Constructed at Fujian Southeast Shipbuilding in China, and delivered to Vroon Offshore Services in December 2017, the 80m x 18.4m subsea support vessel VOS Stone commenced work in the German Baltic Sea in March, undertaking array cabling work at the 385MW Arkona offshore wind farm. The vessel is a sister to the 2016-built VOS Start, which has been deployed at the 330MW Walney Extension offshore wind farm in the Irish Sea. The 2,500dwt VOS Stone will also provide logistical support (including arranging fuel deliveries) and offshore accommodation at the Arkona site on behalf of energy major E.ON. The vessel features 87 beds – 27 for her crew, the remainder for her complement of turbine technicians – as well as 260m² of open deck space and 190m² of sheltered deck space. As a FiFi Class 1 vessel, she also comes equipped with two fire monitors, each rated 1,200m³ (1.2 million litres) per hour, with the ability to throw water at distances of more than 120m and at heights of up to 50m. VOS Stone is powered by two MAK engines, each rated 2,400kW, driving twin controlled-pitch propellers and three bow thrusters: the latter comprising a pair of 12tonne, 800kW electric tunnel thrusters and a 13tonne, 700kW retractable thruster. When navigating at 10knots, the vessel consumes approximately 10 metric tonnes of fuel a day. Deck machinery includes a 50tonne-capacity, active heave-compensated main crane, provided by SMST, as well as: a skidding system; two electro-hydraulic capstans, rated 10tonnes at 24m/min apiece; a pair of tugger winches, each rated 3tonnes; and an auxiliary crane, rated 3tonnes SWL at an outreach of 10m. To facilitate emergency evacuation, VOS Stone also carries two 45-man lifeboats and four 15-man liferafts. 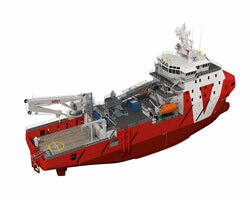 For safe personnel transfer between the vessel and wind turbines, VOS Stone has incorporated Ampelmann’s A400 motion-compensated walk-to-work gangway. This contract signifies the first ever commercial deployment of the A400. This system builds on Ampelmann’s A-type gangway designs, featuring a wider gangway – approximately twice as wide, the manufacturer says– as its predecessor models. This is to facilitate greater use of cargo trolleys and, in particular, Euro-sized pallet trolleys. The A400 has been designed to safely transfer up to 400kg of personnel and cargo in significant wave heights of 3m. Ampelmann adds: “The system can transfer multiple personnel at a time, and features an elevator to support ‘stepless’ policies.” When using a combination of dynamic positioning (DP), the A400 and crane operations, the vessel burns approximately 7 metric tonnes of fuel daily.